In the Western world, the first major work on dream interpretation was the 2nd-century Oneirocritica by Artemidorus, which interpreted the meaning of many subjects of dreams. Dream interpretation was taken up as part of psychoanalysis at the end of the 19th century; the perceived, manifest content of a dream is analyzed to reveal its latent meaning to the psyche of the dreamer. One of the seminal works on the subject is The Interpretation of Dreams by Sigmund Freud. It was in his book The Interpretation of Dreams ('Die Traumdeutung'; literally 'dream-interpretation'), first published in 1899 (but dated 1900), that Sigmund Freud first argued that the foundation of all dream content is wish-fulfilment, and that the instigation of a dream is always to be found in the events of the day preceding the dream. In the case of very young children, Freud claimed, this can be easily seen, as small children dream quite straightforwardly of the fulfilment of wishes that were aroused in them the previous day (the 'dream day'). In adults, however, the situation is more complicated -- since in Freud's submission, the dreams of adults have been subjected to distortion, with the dream's so-called 'latent content' being a heavily disguised derivative of the 'manifest' dream-thoughts present in the unconscious. As a result of this distortion and disguise, the dream's real significance is concealed: the dreamer is no more capable of recognising the actual meaning of their dream than the hysteric is able to understand the connection and significance of their neurotic symptoms. In Freud's original formulation the latent dream-thought was described as having been subject to an intra-psychic force referred to as 'the censor'; in the more refined terminology of his later years, however, discussion was in terms of the super-ego and 'the work of the ego's forces of defence'. 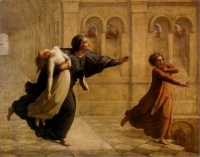 In waking life, he asserted, these so-called 'resistances' altogether prevented the repressed wishes of the unconscious from entering consciousness; and though these wishes were to some extent able to emerge during the lowered state of sleep, the resistances were still strong enough to produce 'a veil of disguise' sufficient to hide their true nature. Freud's view was that dreams are compromises which ensure that sleep is not interrupted: as 'a disguised fulfilment of repressed wishes', they succeed in representing wishes as fulfilled which might otherwise disturb and waken the dreamer. "You entirely disregard the apparent connections between the elements in the manifest dream and collect the ideas that occur to you in connection with each separate element of the dream by free association according to the psychoanalytic rule of procedure. From this material you arrive at the latent dream-thoughts, just as you arrived at the patient's hidden complexes from his associations to his symptoms and memories...The true meaning of the dream, which has now replaced the manifest content, is always clearly intelligible." Freud listed the distorting operations that he claimed were applied to repressed wishes in forming the dream as recollected: it is because of these distortions (the so-called 'dream-work') that the manifest content of the dream differs so greatly from the latent dream thought reached through analysis -- and it is by reversing these distortions that the latent content is approached. Condensation — one dream object stands for several associations and ideas; thus "dreams are brief, meagre and laconic in comparison with the range and wealth of the dream-thoughts". Displacement — a dream object's emotional significance is separated from its real object or content and attached to an entirely different one that does not raise the censor's suspicions. Representation — a thought is translated to visual images. Symbolism — a symbol replaces an action, person, or idea. To these might be added 'secondary elaboration' -- the outcome of the dreamer's natural tendency to make some sort of 'sense' or 'story' out of the various elements of the manifest content as recollected. (Freud, in fact, was wont to stress that it was not merely futile but actually misleading to attempt to 'explain' one part of the manifest content with reference to another part as if the manifest dream somehow constituted some unified or coherent conception). 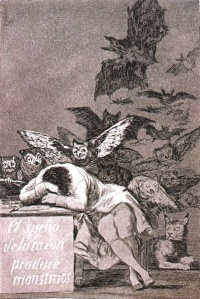 Freud considered that the experience of anxiety dreams and nightmares was the result of failures in the dream-work: rather than contradicting the 'wish-fulfilment' theory, such phenomena demonstrated how the ego reacted to the awareness of repressed wishes that were too powerful and insufficiently disguised. Traumatic dreams (where the dream merely repeats the traumatic experience) were eventually admitted as exceptions to the theory. "The assertion that all dreams require a sexual interpretation, against which critics rage so incessantly, occurs nowhere in my Interpretation of Dreams...and is in obvious contradiction to other views expressed in it." On another occasion, he suggested that the individual capable of recognising the distinction between latent and manifest content "will probably have gone further in understanding dreams than most readers of my Interpretation of Dreams". Although not dismissing Freud's model of dream interpretation wholesale, Carl Jung believed Freud's notion of dreams as representations of unfulfilled wishes to be simplistic and naive (Freud returned the favor by publicly opining that Jung was fine for those who were looking for a prophet [Freud, "Introductory Lecutures"]). Jung was convinced that the scope of dream interpretation was larger, reflecting the richness and complexity of the entire unconscious, both personal and collective. Jung believed the psyche to be a self-regulating organism in which conscious attitudes were likely to be compensated for unconsciously (within the dream) by their opposites. Jung believed that archetypes such as the animus, the anima, the shadow and others manifested themselves in dreams, as dream symbols or figures. Such figures could take the form of an old man, a young maiden or a giant spider as the case may be. Each represents an unconscious attitude that is largely hidden to the conscious mind. Although an integral part of the dreamer's psyche, these manifestations were largely autonomous and were perceived by the dreamer to be external personages. Acquaintance with the archetypes as manifested by these symbols serve to increase one's awareness of unconscious attitudes, integrating seemingly disparate parts of the psyche and contributing to the process of holistic self understanding he considered paramount. He cautioned against blindly ascribing meaning to dream symbols without a clear understanding of the client's personal situation. Although he acknowledged the universality of archetypal symbols, he contrasted this with the concept of a sign — images having a one to one connotation with their meaning. His approach was to recognize the dynamism and fluidity that existed between symbols and their ascribed meaning. Symbols must be explored for their personal significance to the patient, instead of having the dream conform to some predetermined idea. This prevents dream analysis from devolving into a theoretical and dogmatic exercise that is far removed from the patient's own psychological state. In the service of this idea, he stressed the importance of "sticking to the image" — exploring in depth a client's association with a particular image. This may be contrasted with Freud's free associating which he believed was a deviation from the salience of the image. He describes for example the image "deal table". One would expect the dreamer to have some associations with this image, and the professed lack of any perceived significance or familiarity whatsoever should make one suspicious. Jung would ask a patient to imagine the image as vividly as possible and to explain it to him as if he had no idea as to what a "deal table" was. Jung stressed the importance of context in dream analysis. Jung stressed that the dream was not merely a devious puzzle invented by the unconscious to be deciphered, so that the 'true' causal factors behind it may be elicited. Dreams were not to serve as lie detectors, with which to reveal the insincerity behind conscious thought processes. Dreams, like the unconscious, had their own language. As representations of the unconscious, dream images have their own primacy and logic. In 1953, Calvin S. Hall developed a theory of dreams in which dreaming is considered to be a cognitive process. Hall argued that a dream was simply a thought or sequence of thoughts that occurred during sleep, and that dream images are visual representations of personal conceptions. For example, if one dreams of being attacked by friends, this may be a manifestation of fear of friendship; a more complicated example, which requires a cultural metaphor, is that a cat within a dream symbolizes a need to use one's intuition. For English speakers, it may suggest that the dreamer must recognise that there is "more than one way to skin a cat", or in other words, more than one way to do something. In the 1970s, Ann Faraday and others helped bring dream interpretation into the mainstream by publishing books on do-it-yourself dream interpretation and forming groups to share and analyze dreams. Faraday focused on the application of dreams to situations occurring in one's life. For instance, some dreams are warnings of something about to happen – e.g. a dream of failing an examination, if one is a student, may be a literal warning of unpreparedness. Outside of such context, it could relate to failing some other kind of test. Or it could even have a "punny" nature, e.g. that one has failed to examine some aspect of his life adequately. Dream sharing online and dream blogs allow people to post keywords or an entire dream and receive an analysis. Unless indicated otherwise, the text in this article is either based on Wikipedia article "Dream interpretation" or another language Wikipedia page thereof used under the terms of the GNU Free Documentation License; or on original research by Jahsonic and friends. See Art and Popular Culture's copyright notice. This page was last modified 20:26, 6 March 2018.